March 10, 2019. A day that will live long in the memory for many FC Nordsjælland fans. Witnessing an entertaining 2-2 home draw with Danish Superliga leaders FC Copenhagen would be handsome enough reward for many of the club’s supporters in normal circumstances. But the fact that the precious point was secured by goals from Beyoncé and Vigdís Finnbogadóttir, the first female president of Iceland, will have made the result even sweeter for a club that prides itself on being different. At least, those are the goalscorers the match referee would have recorded if he relied solely on the players’ shirt names when finalising his match report. While it would have sent the internet into meltdown had Beyoncé popped up with a 67th minute penalty to put FC Nordsjælland 2-1 ahead, the honour was actually taken by Andreas Skov Olsen, who asked for the world-famous singer’s name to be embossed on his shirt as part of the club’s International Women’s Day celebration. In an unprecedented tribute, all FC Nordsjælland players took to the pitch in jerseys displaying not their own names on the back, but the names of female role models that inspire them, including Serena Williams, Rosa Parks and Greta Thunberg. The initiative followed an international survey that found only 20% of males were able to name a female role model apart from their mother, even if they believed in gender equality. In response, each member of the FC Nordsjælland squad participated in an educational workshop before making their selection – and after the match the jerseys were auctioned off, with the proceeds going to FC Nordsjælland’s women’s department. The project won the club friends around the world. But cynics brushing this off as a PR stunt will have overlooked the fact that equal opportunities for girls and boys is part of the DNA of a club setting itself apart in the landscape of modern football in terms of its structure, values and business model. And that FC Nordsjælland has form for doing things differently – particularly when it comes to sustainable development. 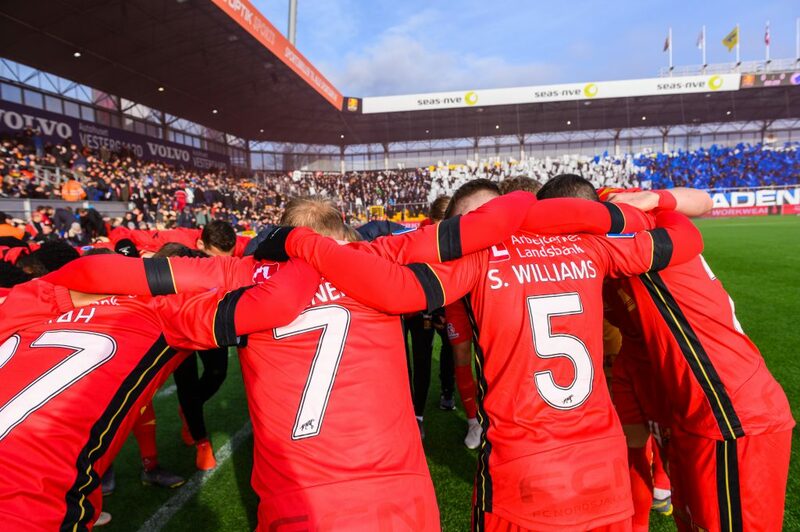 In December 2015, FC Nordsjælland was the subject of a takeover – not by an oil magnate or a consortium – but by an NGO called Right to Dream, renowned for establishing what has become the most successful football academy in the whole of Africa. This unique partnership appears at first to be the wrong way around – with football clubs increasingly scouring Africa to purchase feeder academies in their own name – but is showing the football world an exciting development model, guided by the UN Sustainable Development Goals, that can be both successful and sustainable. Since being founded in 1999 by Tom Vernon, 48 graduates of the football-oriented residential school in Ghana have gone on to a career in professional football, with 24 of them representing their country’s national team at youth and/or senior level. In addition, more than 70 have been awarded scholarships at educational institutes in the UK and the US, highlighting Right to Dream’s ambition to shape individuals who can create change in the environment or community they come from. And now, academy graduates are beginning to make a splash 500 miles away in the Danish town of Farum, at a club with a strong tradition in nurturing young talent. In fact, the FC Nordsjælland squad chosen to face FC Copenhagen included four players who made the step-up directly from Right to Dream, and from next season the club are aiming to play with a squad comprised 100% of recruits from their academies in Denmark and Ghana. Already the figure is at 88%, and with an average age of 21.4 years old they are by far the youngest senior squad competing in professional-level European football. The man overseeing the realisation of this vision is Søren Kristensen, who was brought in by the owners in 2017 with a track record of growing global brands, such as Coca-Cola and Nespresso, in a sustainable way. For Kristensen, a newcomer in the world of football, the project offered him the opportunity to do something for other people – rather than for profit-focused shareholders. “The reason for [FC Nordsjælland] being unique among football clubs is that it is owned by a not-for-profit organisation, which means that the money that we’re making is all being re-invested into more opportunities for young people to have their dreams fulfilled,” he explains. Indeed, this year’s initiative wasn’t the club’s first activation around International Women’s Day. In 2018, FC Nordsjælland opened its first women’s academy, providing girls access to the same number of training hours, the same level of coaching, the same facilities and the same home stadium as the boys. This is not something the club is going to earn money from doing, according to Kristensen, but is doing because of its values-driven approach. Three months after opening its women’s academy in March 2018, another big announcement was made: FC Nordsjælland became the first professional football club to sign up to the Common Goal initiative. Co-devised by Juan Mata, and boasting a roster of international stars such as Giorgio Chiellini, Alex Morgan and Kasper Schmeichel, Common Goal asks footballers to donate one per cent of their total earnings to global NGO streetfootballworld, which currently supports more than 140 high-impact football projects reaching over two million disadvantaged young people every year. In FC Nordsjælland’s case, the club is now donating one per cent of its turnover to Common Goal, while all new contracts – including players, management and club administration – include the one per cent commitment, with the ability to opt out. Every year, members will take part in a vote to decide the three projects that their money will be split towards, according to which ones are most closely aligned with the club’s work and values. Common Goal encourages its donors to visit their chosen projects and see how their money is making a difference, and FC Nordsjælland have since sent youth teams to projects in Africa and eastern Europe, where the young players get hands-on experience of ‘give-back’ initiatives and participate in a two-way cultural exchange with the beneficiaries. The importance attached to giving back is part of a wider focus at the club on character development – one of the three cornerstones of Right to Dream along with education and football – and which now underpins their entire approach to player and staff recruitment, with a strong preference for individuals with a growth mindset. So far, the results have been positive. A survey last year asked the parents of all of the club’s youth players whether they felt a positive change in their child’s behaviour when they came home from football after starting character development sessions – and more than 80% said yes. The long-term goal is to establish a supply chain of socially responsible players with a shared set of values, and a purpose away from football. But what about the performances on the pitch? And there lies the crux: how exactly can FC Nordsjælland balance their sustainable approach with being successful in terms of both results and commercial revenue? Last season FC Nordsjælland finished third, earning qualification for the UEFA Europa League; and this year the team are again competing in the top half play-offs. Management believes that a key factor behind this success is the character development helping players get ready for the step-up to first-team football earlier. Sixteen players were selected for their national youth teams at the most recent international call-ups, while at least one 17-year-old player has featured for FC Nordsjælland in every Superliga match this campaign. Commercially, at present the club is depending entirely on the funds generated from the transfers of players who have progressed through their academy, but the medium to long-term aim is to become more sustainable by generating alternative income streams. Whether it’s generating revenue from increased worldwide interest in the ‘hero stories’ coming out of the Right to Dream movement, or attracting sponsors and partners who wouldn’t usually compromise their ethics by investing in the football industry, there does seems to be clear value in FC Nordsjælland’s approach. And perhaps the biggest endorsement of that is a widening level of interest from other clubs. In the first half of the season, delegations from three Bundesliga clubs (Kristensen believes German clubs are the most advanced in Europe when its comes to CSR) conducted visits to FC Nordsjælland, curious about how they have had success on a low budget with such a young team, while the club has also entertained visitors from the English Premier League. FC Nordsjælland’s model is so radically different that it is unlikely that any other club will copy the full package, but areas such as their academy system, scouting network and character development are generating serious interest. And because of Right to Dream’s ambition to change football for the better, the club is operating a no-secrets policy, and welcoming those looking to follow their methods with open arms. “We do it because we believe in it, and because we see people in the industry with similar values and principles,” says Kristensen. “I think if we stand shoulder-to-shoulder together, then we’re stronger. Do you know of any other professional clubs trying to change football for the better? And should more clubs follow FC Nordsjælland’s lead – and consider signing up to Common Goal? Let us know in the comments below. Crumlin utd fc- local amateur league club. Tackling social issues, promoting nutrition, and community cohesion in NI.